The planets have aligned in such a way these days that the PPCC finds itself watching movie after movie featuring classical horror themes. Zombies, ghosts (and their busters), and now, vampires and werewolves seem to be our lot, and we're not entirely averse, maybe because we never really paid much attention to these strange creatures and their comical ways. Underworld: Rise of the Lycans fell in our To Watch list because it features Michael Sheen, who impressed us so much with his performance in The Damned United that we became ravenous for more. We were furthermore encouraged because Bill Nighy, the lovely and wonderful, also featured. Unfortunately, it wasn't really worth it. We were so bored by the end of this mindless, endless, 90-minute junk food that we felt not unlike vampire Viktor (Bill Nighy) when he meets sunlight: fizzling away into a blackened crust of our former selves. 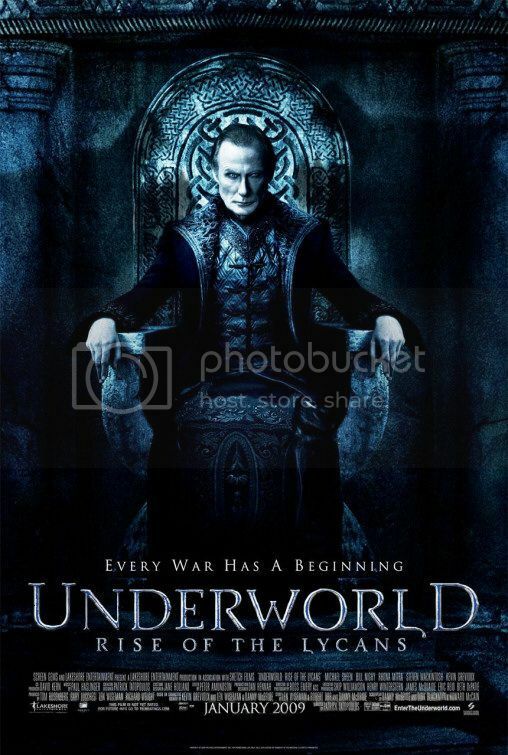 Set in an unplaceable Gothic wonderland filmed in various shades of blue, Underworld: Rise of the Lycans tells the story of the nobly laboring Lycans (werewolves) and their evil vampire overlords. While the bastardly vampires, led by Viktor, are all icy irises and hissing lisps, the werewolves toil with oily hair and oily muscles. And everyone is in black leather. The Lycan Spartacus, Lucian (Michael Sheen), is the only character afforded any warm colors as his muscly torso glistens in various firelights while he plots the slave uprising. Our hero! Hairy, the Nobly Naked. Our distressed damsel! Lady Poutsalot. Our dastardly villain! Bill Nighy, the Vampire Guy. After interminable fight scenes, numerous escapes and re-captures, and Lucian getting (sexily?) whipped or Lucian (sexily?) transforming back into human form only to find all his clothes are missing (! ), this film finally grinds to a halt. We couldn't have been happier. Performance-wise, Michael Sheen flexes his muscles - especially the ones in his neck - and delivers some vague sparks of life. He submits a few meltdowns, which the PPCC always accepts with pleasure, but otherwise he is saddled with a cardboard hero role in a cardboard movie. Rhona Mitra likewise pouts and sulks and sometimes, refreshingly, lops people's heads off, but even this token feminism doesn't redeem an otherwise typical damsel-in-distress. Around her, characters start saying things like "My lady!" and "My love! ", and she even ends up under house arrest. Only her hairy, snarling knight can save her! Bill Nighy, who is making a (great!) career out of playing slightly off-center, slightly sniffily posh old lords is his usual demented self. We amused ourselves with imagining his performance as Viktor to be a natural extension of his performance in Love, Actually. Two-flavored meltdown: the human flavor. Theme-wise, with all the bizarre sexualization that vampires must endure (and werewolves?! only one werewolf is allowed to be attractive, and that is Remus Lupin! ), we wondered a bit about this film's relationship to the highly popular and highly Victorian Twilight series, with all its virginal angst. Unfortunately, we soon lost interest in that comparison, as we lost interest in this film entirely. Goodness, at least Twilight has a kickin' soundtrack! Maybe a bonus track by Thom Yorke would have woken us up, as clearly even Michael Sheen screaming enough to pop a blood vessel only barely roused us from nodding off. Well, we can't fix the film, but we can make sure this review isn't boring anymore. Enjoy! For me, the best thing about this movie was that I saw it literally one week before seeing Frost/Nixon. Anarchivist - Ah ha! Nixon as vampire? Discuss.